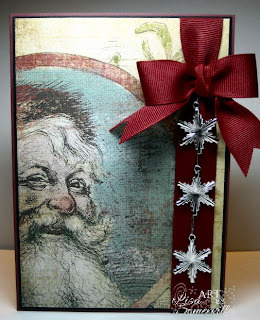 Just a quick Christmas card getting in under the wire for CardPatterns #87. Here I let the beautiful My Minds Eye paper do the work for me, as I didn't stamp anything, just added some Ribbon and Silver Snowflakes. Sometimes being an artist is knowing when just enough is perfect! no stamping? WHAT??? No, it's darling. Fabulous! Love that paper and you used it wonderfully! Love the dangling snowflakes too! The beautiful DP was all that was needed. The snowflakes are really quite nice! Great card! Oh gotta love that St. Nick! Love how you coordinated that image to create the shape on CP sketch. I've got this paper and wondered what to do with it! Now I know!! Great card, Lisa!